As much as I hate SMS, I hate voicemail even more. It’s a truly broken experience. It’s linear. If you have 10 messages in your mailbox, it doesn’t matter if the 9th is the most important. You have to step through them one by one navigating with cryptic commands. The key information in a message is hard to get to. The key piece of information in most voicemail messages is who called. You often have to listen through the entire message the phone number. Or memorize what key will play the metadata. Message notifications are binary. On many systems, there is a single icon regardless of how many messages you have. Often I’ll let a call go to voicemail and then I’ll get another voicemail later. With the binary notification, I don’t know that the second message came in. Apple’s solution gets around all that, providing a simple visual interface for voicemail. That’s not revolutionary; a lot of companies (including one that I used to work for) have tried to fix voicemail. 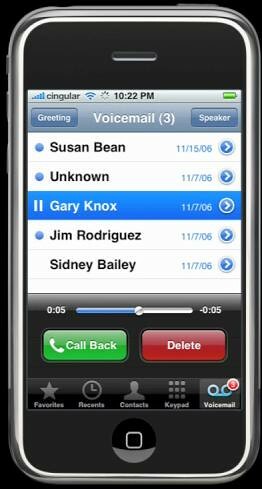 What is significant in Apple’s move is that they were able to get Cingular to deploy a new network feature to support visual voicemail. It’s another example of how Apple broke all the rules of handset manufacture/carrier relations. In the long term, voicemail is dead. As presence and IM get incorporated more tightly into mobile devices, people will only call when they know you’re available. AOL’s offices are a window into this future. Most conversations are done over IM and email. When we need to talk to someone, the protocol is to check their IM presence before calling. It may seem clunky. But it beats dealing with voicemail. This entry was posted in apple, iphone, ipod, mobile, wireless, wireless data. Bookmark the permalink. Cingular is rebranding itself as AT&T (or so my monthly statement alleges). you said your voicemails get sent to you via email as an mp3? I’ve been trying to use some of my voicemails in a multimedia project im working on. Could you relay how to set this up?